East Belfast community worker Ian Ogle “met his end with unparalleled bravery and died protecting those he believed to be in danger”, mourners at his funeral heard. Grieving family and friends packed into the Covenant Love Church on the Albertbridge Road this morning, while hundreds more gathered outside to pay their respects to the father-of-two, who was known to many as ‘Big O’. 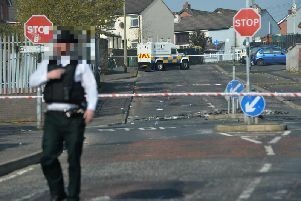 The 45-year-old was stabbed in the back 11 times and suffered a fractured skull in a frenzied attack by a gang of men – possibly members of the UVF – at Cluan Place on Sunday, January 27. His coffin, draped in a white flag, was carried past the spot where he was murdered, which is just yards from the church where his funeral service took place. “He valued the lives of those he felt the need to protect more than his own,” he said. Pastor Sambrook spoke of how he talked with Mr Ogle and prayed with him at the corner of Cluan Place just moments before the deadly attack, which he described as “a senseless act of barbarity”. “I found myself kneeling beside him as he lay dying, praying that the Lord would be with him,” he continued, urging people to remember Mr Ogle’s grieving family – his son Ryan who was with him when he died, daughter Toni and partner Vera. “Ian met his end with unparalleled bravery and died protecting those he believed to be in danger without a second thought for his own safety. Ian willingly gave his life for others that night while others willingly took it from him. Pastor Sambrook went on to say how Mr Ogle had “moved away from his past” and had increasingly turned to God towards the end of his life, saying the Lord’s Prayer every day. While stating that justice must be done, he appealed for no retaliation for the murder. Ahead of the service, members of East Belfast Protestant Boys Flute Band lined Cluan Place and a lone piper played Abide With Me and Highland Cathedral as Mr Ogle’s remains were carried to the church. Assistant pastor Gary Chettleburgh gave a scripture reading before tributes were paid by Mr Ogle’s daughter, Toni Johnston Ogle, and community pastor Davy Ralston, who spoke of his friend’s love of Everton, Glentoran and Rangers football clubs. Those who attended the funeral included UUP peer Lord Empey, East Belfast MP Gavin Robinson and the Orange Order’s Rev Mervyn Gibson. Mr Ogle was laid to rest in Roselawn Cemetery.